Textile items that are more than one century old meet the commonly accepted definition of antiques. They convey history through their intricately woven fabrics and rich designs. Having such an item in your possession requires that you take care of it so that it remains in the best possible condition, especially if it is an heirloom. Articles of clothing or items made from fabric that is deemed to be collectible or meant to be stored for future generations also require special handling. Your textiles should be as clean as possible before you place the items into storage. 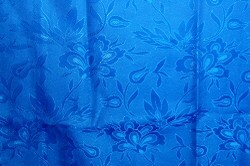 The abrasive effect of dust and dirt can destroy the fabric. You should hand wash your washable and colorfast items, but do not iron or starch the material. Machine washing or ironing your textiles can damage the fabric. The heat from an iron may alter the fabric’s color. Use a low-suction, handheld vacuum cleaner to remove surface dust and debris from items that you cannot wash or dry clean. Position the item on a flat surface and cover it with a fiberglass screen. Gently remove any loose abrasive materials. You shouldn’t vacuum textile items that contain beads or embroidered pictures because the suction may remove these decorative elements. It is best to clean these fragile items by wiping the fabric with a damp cloth and hanging them up to air dry. Attics and basements do not provide the proper climatic conditions for antique fabric. Hot, dry air will make the fibers brittle. Damp conditions promote the growth of mold that will rapidly damage the fabric and create a musty odor. Your antique textiles need a location that is cool and dry. The ideal humidity level for these materials is between 40 and 50 percent. The best temperature range is 65 to 70° Fahrenheit. The storage area should employ effective pest-control measures. A climate-controlled self-storage unit can provide these optimal conditions. You should lay your antique textiles flat in a chest of drawers or hang the items with padded hangers to prevent creases and wrinkles. Storing the textiles flat minimizes pressure from the weight of the material and the abrasive effects of any folds. You should roll your rugs, tapestries, tablecloths and other large items. Use a non-metallic pole that extends beyond the edges of the fabric because a metal pole may stain the item. Ensure that you don’t roll any creases or wrinkles into the fabric. If you must fold the textile, you should use washed, unbleached muslin padding to avoid sharp creases that may damage the fibers. Fold the item along the seams if possible. Store your cherished textiles in an area free from damaging UV rays that fade colors and contribute to the breakdown of the woven fibers. These rays are emitted from fluorescent lights as well as the sun. If you can’t keep the textiles out of direct sunlight or away from fluorescent bulbs, you should place them behind UV filtering glass. Incandescent bulbs and a shadow box with filtered glass are the best way to illuminate and display smaller items, such as handkerchiefs, fans and gloves. You shouldn’t place your textiles in an airtight environment, such as a vacuum storage bag, because the fabric needs to breathe. Antique fabrics should not come into direct contact with wood, tissue or wrapping paper. Plastics emit fumes as they age. It is best to wrap your textile items in cotton muslin and place it in a plastic bag with extra space. Ensure that all your storage accessories are acid-free. You should periodically inspect and air out your stored antique textiles. Refold your folded items in different locations to prevent damage to fibers that can occur due to creases over time. John Hannah is an avid blogger who loves web design and rock climbing. His current projects include work for OmniStorage that serves the Holden Beach, North Carolina area.